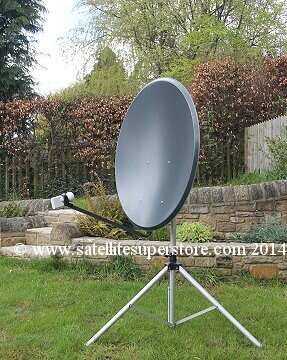 3 degree - 1.0m dish with 3 degree monoblock. 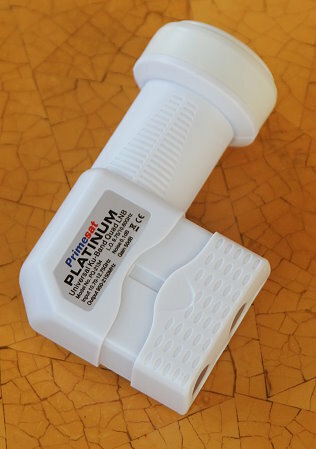 Single or quad outputs. 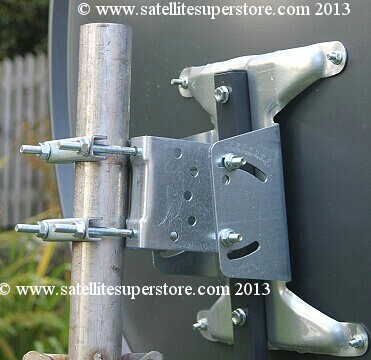 20 degree multibrackets - 85cm multibracket dish 85cm multibracket dish with multiswitch. Multiple outputs. 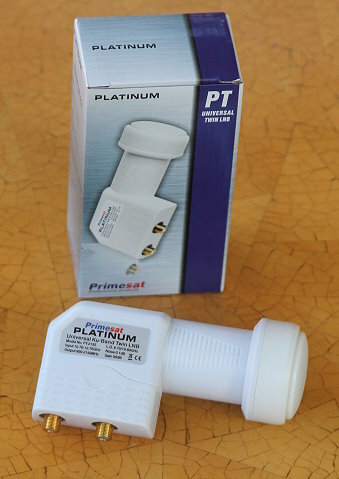 Primesat 85cm "Easy Fit" and clear dish kits ideal for 19E & 13E. The first time we assembled the "Easy Fit" dish it took less than 60 seconds. It would be even faster if we had done it before. this one. 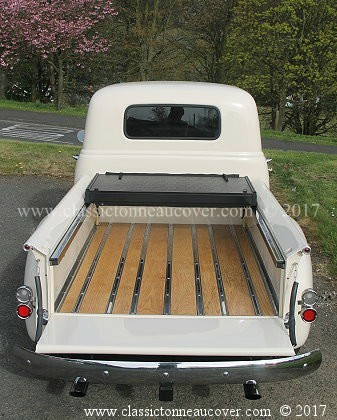 Ideal for conservation areas or where appearance is a prime concern. Again plenty of signal. Integrated LNBs and diseqc switch. This is the White Tech monoblock from Inverto. Quality brandname "Primesat" 85cm easy fit and transparent dishes. Optional standard wall mount. The monoblock can be upgraded to a twin or quad monoblock below. 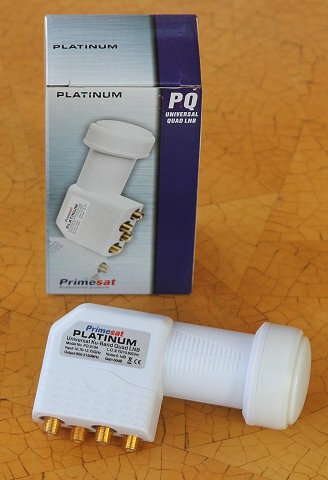 Primesat 85cm "Easy Fit" fixed dish kit ideal for 19E & 13E. Wall mount included. 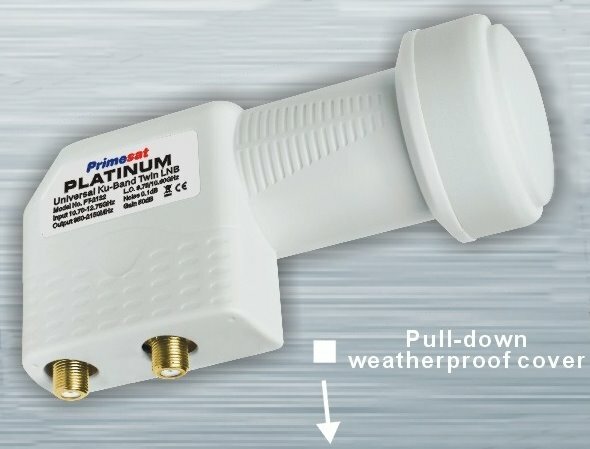 instead of a standard mount, you can deduct the wall mount from your dish kit. See below. Primesat transparent 85cm fixed dish kit ideal for 19E & 13E. Wall mount included. Twin and quad monoblock dish options for 19E & 13E. Inverto black Pro monoblocks also have a very high reputation. in price. This is a DISH OPTION ONLY. To buy these monoblocks separately go to the Monoblock page. 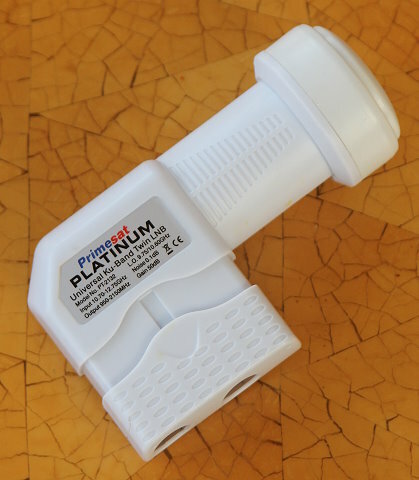 Upgrade to twin monoblock option for 19E & 13E. "Replace the single monoblock in my dish order for a twin Titanium monoblock"
Upgrade to quad monoblock option for 19E & 13E. "Replace the single monoblock in my dish order for a quad Inverto Black Pro monoblock"
Monoblock LNBs to look at two satellites (6 degree and 3 degree) are on the Monoblock page. Multibrackets for 2 LNBs that are up to 20 degrees apart are on the multibracket page. 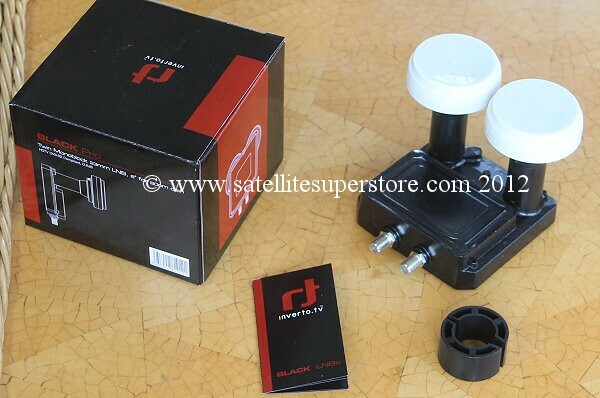 fixed dish kit ideal for 19E & 13E. Aluminium dishes are lighter, don't rust and are higher quality. dishes. A high quality product range. Very good value considering the higher grade materials used and the superb performance. on the back of the dish (where elevation is adjusted) is galvanised. 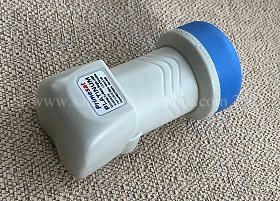 It will clamp to poles from 35mm to 60mm diameter. This dish would be ideal for Scotland and in the north or for "all weather" capability in the worst of the winter. in northern Scotland. This monoblock can be upgraded to a twin or quad monoblock above. 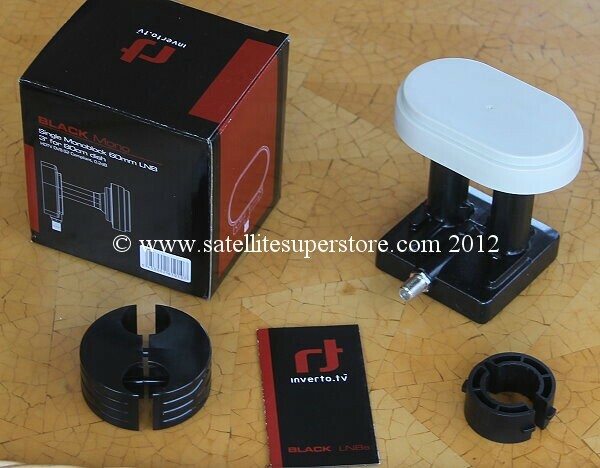 Primesat 1.0m fixed dish kit ideal for 19E & 13E. Wall mount included. diseqc switches and one of these switches is built into this monoblock. They also make professional meters. The monoblock can be upgraded to a quad monoblock below. 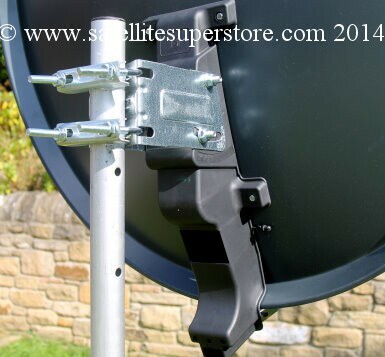 Primesat 85cm "Easy Fit" fixed dish kit ideal for 9E & 13E. Wall mount included. Primesat 85cm clear transparent dish kit ideal for Hotbird at 9E & 13E. Quad monoblock dish options for 9E & 13E. Unfortunately there are no twin 4.3 degree monoblocks. Only Quad output. in price. This is a DISH OPTION ONLY. To buy this monoblock separately go to the Monoblock page. 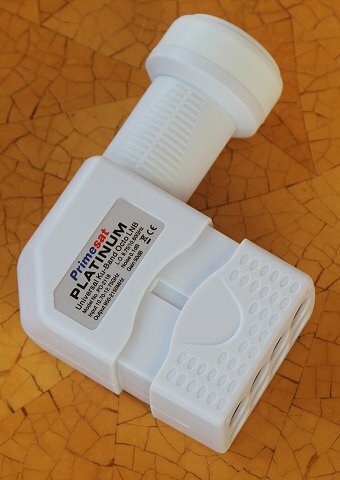 Upgrade to quad Maximum monoblock option for 9E & 13E. 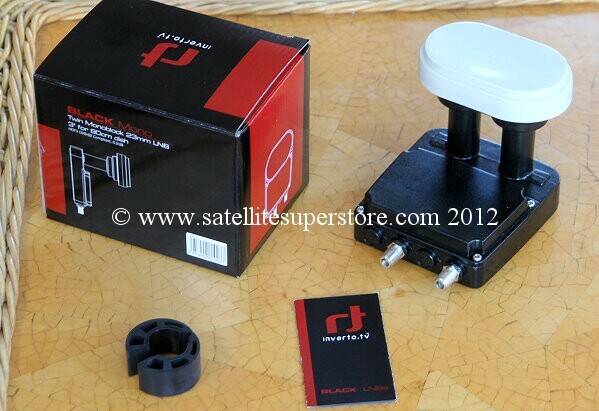 "Replace the single monoblock in my dish order for a quad monoblock"
LNB is set to. Integrated LNBs and diseqc switch. Optional wall mount. This is the Inverto Black Pro monoblock. It has an excellent reputation. An ultimate performance monoblock. You can upgrade to a twin monoblock below. instructions are poor and best ignored. Use ours as we have worked out all the shortcuts. 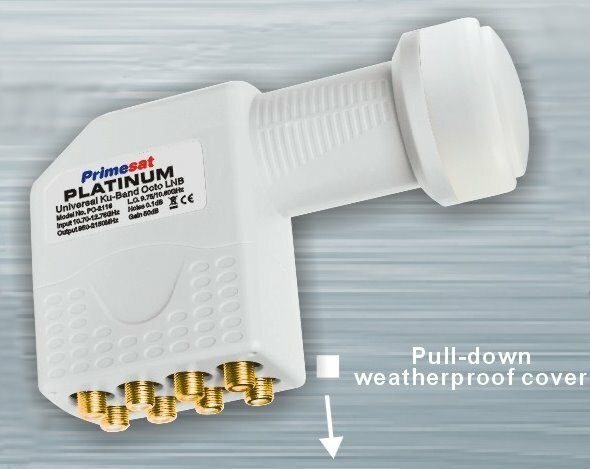 Primesat 1.0m fixed dish kit (e.g. for 16E & 13E). Wall mount included. Twin Inverto 3 degree monoblock dish option. "Replace the single monoblock in my dish order for a twin monoblock"
and many other options. The "East Fit" dish only takes a couple of minutes to assemble. It has a gain of 39.1dBs. More details. The clear transparent dish is ideal for conservation areas and is very clear. The sunlight and background can shine through. 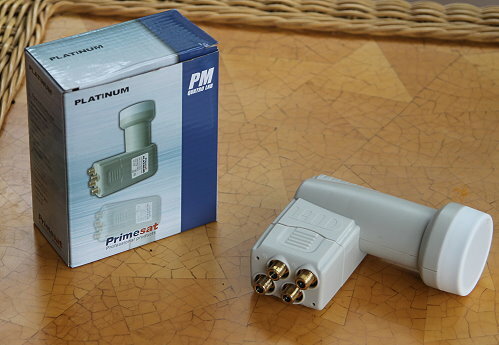 Included are two single Primesat Platinum high performance 0.1dB LNBs from "Primesat Professional Products". best ignored). Use ours as we have worked out all the shortcuts. 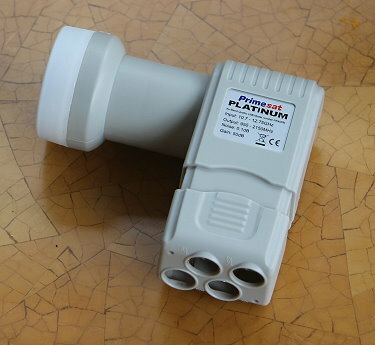 Extra fittings are provided so that a 3rd LNB can be added later. You can change the 2 single LNBs to 2 twin, 2 quad, 2 quatro or 2 octo LNBs (add these options twice for two LNBs). When using 2 twin LNBs, you need an extra 2-way diseqc switch. With two quad LNBs you need 2 extra 2-way diseqc switches etc. 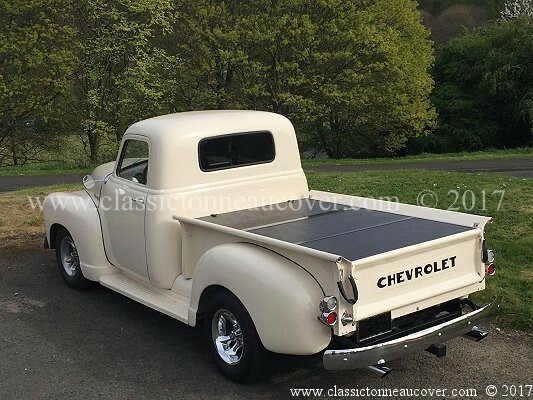 UK - mainland UK delivery is included in the price, (VAT info.) (Shipping options. Discounted shipping on all web orders. diseqc switch and wall mount. 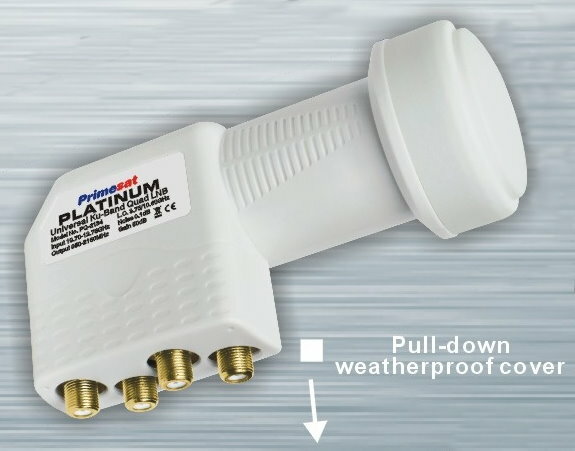 This kit is for multiple receivers. 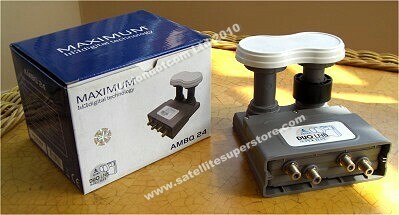 This kit is ideal for providing multiple satellite points in various rooms and then viewing channels from 2 satellite. 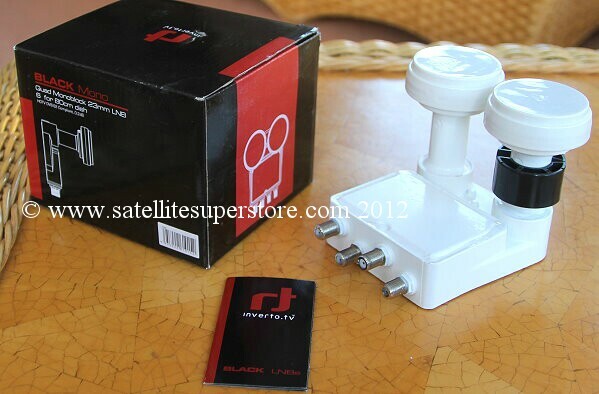 dishes are ideal for Astra 2 at 28E and Hotbird at 13E or Astra 1 at 19E and other satellite combination options. manufacturers instructions are poor and best ignored. Use ours as we have worked out all the shortcuts. 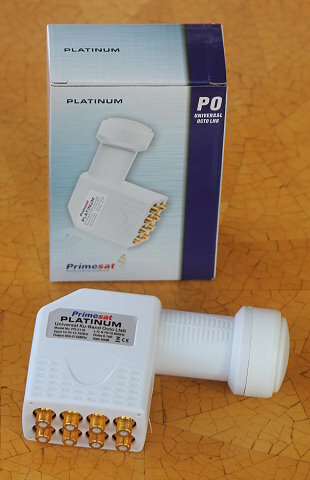 Included is the quatro Primesat Platinum high performance 0.1dB LNB from "Primesat Professional Products" is available. You can upgrade the multiswitch from 8 outputs from 12 outputs to 26 outputs below. LNBs. 9 X 8 EMP Centuari multiswitch and wall mount. Upgrade an EMP Centauri 9 X 8 multiswitch to an EMP Centauri 9 X 12 multiswitch. 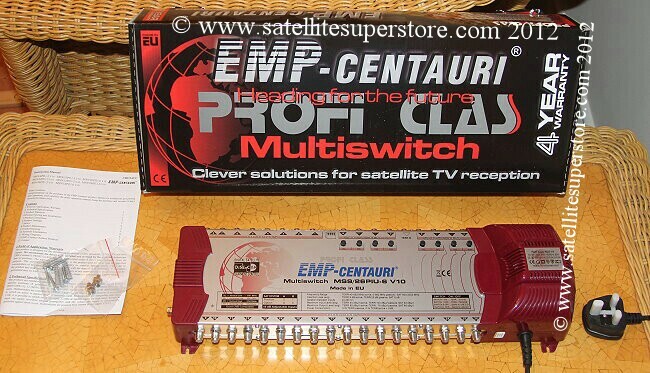 Upgrade an EMP Centauri 9 X 8 multiswitch to an EMP Centauri 9 X 16 multiswitch. This is a system option only. We take out one multiswitch from the kit and substitute another. optional LNBs and diseqc switch. Triax 20 degree Multibracket bar only without LNBs or switch. TRIAX Multibracket bar with 2 Titanium LNBs and a 2-way diseqc switch. TRIAX Multibracket bar with 3 Titanium LNBs and a 4-way diseqc switch. TRIAX Multibracket bar with 4 Titanium LNBs and a 4-way diseqc switch.